Time permitting (I spend a couple of hours a day researching, typing, editing) I’m going to start bringing a daily post from the old blog into the new blog, and reprinting it as if it was new. I hope our long time readers won’t mind, but there’s a 677 posts IN THE OLD BLOG. There’s always a link to it in the top left column under ARCHIVE. Our favorite Las Vegas Newbie, Susan of the “Susan Saga” series brought us a gift last night. 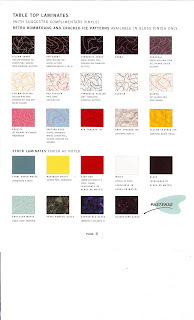 It was the catalog of her favorite retro supplier. 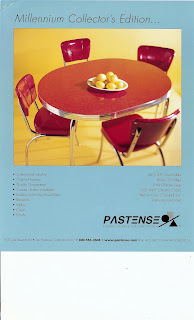 When she wanted to re-upholster her 50’s dinette set, she went looking (online, of course) for the appropriate vinyl material. She found a terrific source and it turns out, they manufacture all kinds of Retro Fun. 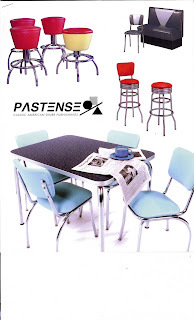 Tables, chairs, appliances, toys, planters, stools,….. Meet PASTENSE, a San Francisco based company with all kinds of great stuff.